An Opinion On Sports: John Smoltz: Is It Time to Fold 'Em? I like John Smoltz. It was terrific seeing him perform at such a high level for the Braves all those years. The only pitcher is MLB history with 200+ wins and 150 saves. How good is that? I didn't necessarily agree with his criticism of the Braves when they opted to release him and his buddy Tom Glavine. I understood where he was coming from, but I think ballplayers are too quick to admit professional sports are a business when they seek free agency, and to quick to cry about it when clubs choose to not re-sign them. It is a business, but it is also a two-way street. You know, the 'good for the goose, good for the gander' thing. 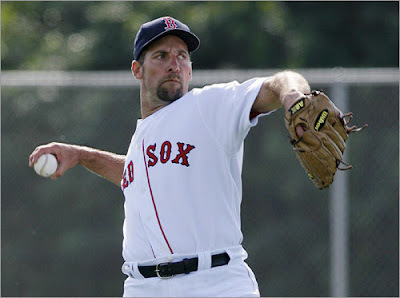 Anyway, Smoltz is coming off of shoulder surgery, and he hasn't been able to recover his dominant pitching form. He was shelled last night by the Yankees, dropping his record to 2-5 and raising his ERA to over 8. At 42 years of age, he is not anywhere close to being the pitcher he once was. A comeback at 42 is a very tall order. Does he have the time, and do the Red Sox have the time? The answer might be no for both parties involved. Perhaps the Braves knew what was up. No team has shown interest in Glavine, and Smoltz isn't Smoltz. We've always heard that the hardest thing for an athlete to admit is that his time has come to hang 'em up. For John Smoltz, that time might have arrived.